People living or working near mold often blame their symptoms on the common cold or seasonal allergies, only to have a light bulb go off when they discover a nasty patch of black mold somewhere in the building. If you’re in this position, seek medical care immediately but do not delay solving the root problem. Get Manhattan mold removal services so you can stop breathing in toxic mold! People with respiratory and immune problems are most likely to suffer from mold exposure, but generally well people can feel the effects, too. If you have asthma, COPD, or any other condition, your normal medications can help but you should still speak with a doctor about the best course of treatment. Less common symptoms include memory loss, light sensitivity, and even bleeding lungs. If your issues go beyond cold symptoms, see a doctor immediately. Mold lurks in damp areas and can become airborne from unseen places like inside of HVAC ducts and cabinetry. Instead of relying on constant allergy medication, it’s best to go the source and get rid of mold. 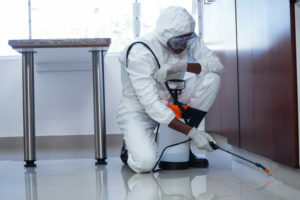 You might picture an extreme course of action like tent fumigation or ripping out drywall, but those conventional mold remediation techniques are no longer necessary. Stern Mold uses the MoldExterm system of antimicrobial cleaning and polymer sealants that stop mold growth for years. Take action to kill mold spores and treat mold exposure—get a free inspection for Manhattan mold removal.